On December 13, 2005 the whole Revels family was saddened to learn of the death of Revels founder Jack Langstaff. I learned of this while on stage in Sanders Theatre, rehearsing for the 35th annual Christmas Revels. It was a great privelege for me to have had the opportunity to have shared the stage with Jack in the 25th Christmas Revels in 1995, and I'm very glad to have known him. He will be missed, but the Revels family he created will go onward, cherishing his memory. Revels founder John Langstaff was born in 1920, appropriately enough on Christmas Eve. As a young boy growing up in Brooklyn Heights, New York, his childhood was filled with music. His parents and friends would often hold impromptu performances of Gilbert and Sullivan and sing Bach chorales, madrigals and Christmas carols together. At eight years of age, he entered the Grace Church Choir School in New York City where he became the boy soprano soloist until his voice changed. He later studied at Philadelphia's acclaimed Curtis Institute of Music and at the Juilliard School in New York. Throughout his adult life, John "Jack" Langstaff has continued to share his profound love and knowledge of music with audiences both young and old. After college, Langstaff, a baritone, embarked in a successful concert career both in the United States and abroad. Langstaff developed a particularly deep appreciation of traditional music after attending a concert by Douglas Kennedy, then director of the English Folk Dance and Song Society and this was the material he focused on when he began making recordings for EMI and HMV in England. Langstaff has had a long and lustrous career in music education. As Head of Music at the Potomac School in Virginia for thirteen years and at the Shady Hill School in Cambridge, Massachusetts, for six, Langstaff has enriched the lives of thousands of children. While teaching, he continued to record in Europe on HMV with producer George Martin, who also produced the Beatles' recordings. For five years, he hosted the popular "Making Music" program on BBC-TV in London and was the moderator of an NBC-TV Saturday morning children's program, Children Explore Books. A former Artistic Director for Young Audiences of Massachusetts, Langstaff was also an award-winning children's author whose twenty-five books include the traditional children's tale, Frog Went a-Courtin' , winner of the Caldecott Medal, St. George and the Dragon , illustrated by David Gentleman, and two collections of African-American spirituals with Ashley Bryan and John Andrew Ross, one of which was a notable Coretta Scott King honor book. Langstaff also produced " Making Music with John Langstaff," a six-set video series designed to show parents, teachers and others who work with children how to involve them in music making and appreciating music. On December 29, 1957 in New York's Town Hall, Langstaff presented the first production of The Christmas Revels. 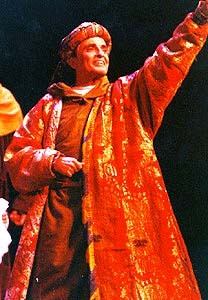 His unique theatrical concept incorporated traditional medieval music, dance, and drama into a communal performance where the whole audience was involved, singing, and even dancing with the cast. That early production was critically successful but not financially. Undaunted, several weeks later, in Washington, D.C., he sold out all 1500 seats in Lisner Auditorium Nine years later, while hosting a program on NBC, Langstaff wrote and hosted an NBC-TV Hallmark Hall of Fame Christmas Eve special, A Christmas Masque, which contained all the elements of his earlier Christmas Revels. A number of soon-to-be famous actors appeared in that production, including a young Dustin Hoffman who played a key part in Langstaff's version of St. George and the Dragon! In 1971, with the aid of his daughter Carol, Langstaff presented the first performance of the Christmas Revels at Sanders Theatre in Cambridge, Massachusetts and The Christmas Revels has been staged there every year since. And Revels has grown, producing an annual Spring Revels, several songbooks, teachers manuals and a choral series . In 1978, Langstaff started Revels Records and has since produced more than a dozen recordings including traditional children's music, folk and gospel recordings, and a growing library of seasonal recordings celebrating the winter solstice, spring and summer, the harvest and the sea. While Revels began with just two performances in Cambridge in 1971, this year Langstaff's Christmas Revels will be performed in 11 locations across the country: Cambridge, Massachusets ; New York City; Washington, D.C. ; Hanover, New Hampshire; Oakland, California; Philadelphia, Pennsylvania; Houston, Texas; Minneapolis/St. Paul, Minnesota; Tacoma, Washington; Portland, Oregon; and Chicago, Illinois. The newest Revels company is Rocky Mountain Revels, in Boulder, Colorado. As the phenomenon of Revels continues to grow, so does the legacy Langstaff left behind. Revels is based on Langstaff's philosophy that celebration unites people, no matter how diverse they are. In an age of technology and progressive alienation, Langstaff recognized a need for connectedness, to each other and to the ancient rituals of our ancestors' ancestors that, quite magically, retain their meaning to this day. In creating the Revels, Langstaff also realized the importance of participation, particularly in music. In his words, "Revels extends its open arms," and this explicit invitation is the key to the involvement Revels continues to elicit from audiences of all ages.